Many people have heard of alfalfa sprouts but may not know much about the herb itself. But the more you learn about alfalfa’s health benefits, the more you may be tempted to give this modest legume a second look. Alfalfa isn’t the “trendiest” herb, but it should definitely be on your radar, because it’s a true “superfood”. You might remember the popularity of these healthy sprouts in the 1980s when they seemed to be on everyone’s plate, or maybe you associate the name with the vintage television character. But the purple and yellow flowering plant has a much longer history than that and has been prized for its agricultural and health benefits for centuries. Also known as lucerne, buffalo grass, and Meidcago sativa, alfalfa plants have been used as animal feed since Roman times and are now cultivated in many countries.. Dairy cows are especially big fans of alfalfa: they are often left to graze in alfalfa fields and consume more alfalfa than any other livestock. Although its roots are in Asia, Europe and the United States are the top producers of alfalfa. In fact, America produces a whopping 41 percent of the world’s supply! Alfalfa has been taken for its medicinal properties for thousands of years. The roots were historically used to lower fever, cleanse the digestive system, and even for weight loss. Alfalfa roots and leaves were also popular in teas. Due to its complex structure, scientists have not yet determined exactly why alfalfa boasts so many health benefits. Researchers do know that it contains an impressive list of healthy vitamins, antioxidant compounds, and minerals like calcium. 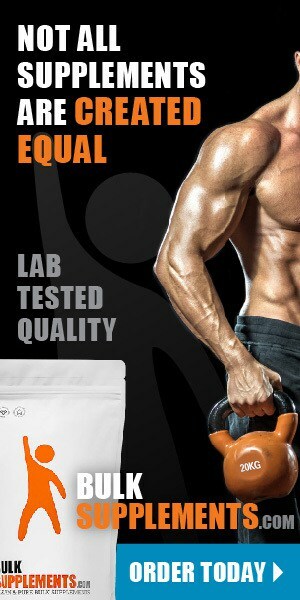 In an animal study from 2008, mice that were fed alfalfa showed lower cholesterol levels than those that were not. Smaller human studies have found similar results; in one study, after eight weeks, participants’ blood cholesterol levels decreased by 18 percent. So how does it work? Scientists believe compounds found in alfalfa called saponins help lower cholesterol levels by decreasing the amount of cholesterol your digestive system absorbs. For those that suffer from asthma or arthritis, alfalfa powder could be a godsend: it contains anti-inflammatory compounds like flavonoids which may ease symptoms of both ailments. Flavonoids, including ones found in alfalfa like biochanin-A, could also help boost immune function, protecting your body from infections like colds and the flu. Alfalfa’s antioxidant content means it may even assist with cell damage associated with disease and aging—especially when it comes to your skin. The vitamins found in alfalfa could help reduce signs of aging like wrinkles, discoloration, and sagging. 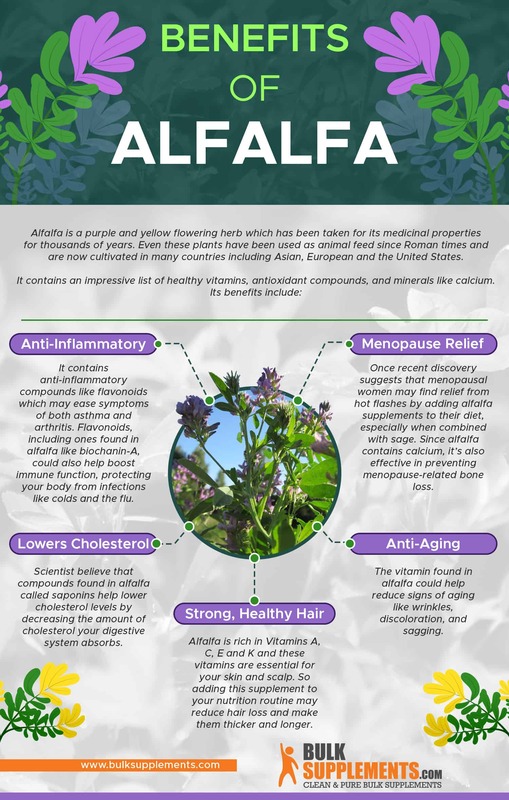 One recent discovery suggests that menopausal women may find relief from hot flashes by adding alfalfa supplements to their diet, especially when combined with sage. Since alfalfa contains calcium, it’s also effective in preventing menopause-related bone loss. Combine alfalfa supplements with weight-bearing exercises to strengthen bones and prevent fractures throughout menopause. In the beauty arena, alfalfa shines when it comes to hair loss. Since your skin and scalp need a healthy mix of vitamins A, C, E, and K (and since alfalfa is rich in all four), adding this supplement to your nutrition routine may be just the thing you need to reduce hair loss and get thicker, longer locks. Raw alfalfa sprouts have a mild, crunchy taste that can be tossed on a sandwich or in a salad.Their tiny size means they don’t need long to cook–when your stir-fry, soup, or stew is almost done,try adding a few sprouts for a boost of nutrition. Breast cancer patients achieved better sleep after eating alfalfa. Growing your own sprouts is quick and only requires water and seeds. California produces the most alfalfa. Only certain species of bees can effectively pollinate this plant. If you’d prefer not to grow the herb, alfalfa extract or powder still offers health benefits while being easy to use and shelf-stable. Stir one tablespoon of alfalfa powder into water, smoothies, or juice. Patients with autoimmune disorders, kidney problems, cancer, diabetes, or other conditions should check with their doctors before taking this supplement. Talk to your doctor before taking alfalfa if you are pregnant or nursing. Certain medications, including ones used to treat blood conditions, and some vitamins can interact with alfalfa, so check your medication list carefully before adding alfalfa to your diet. 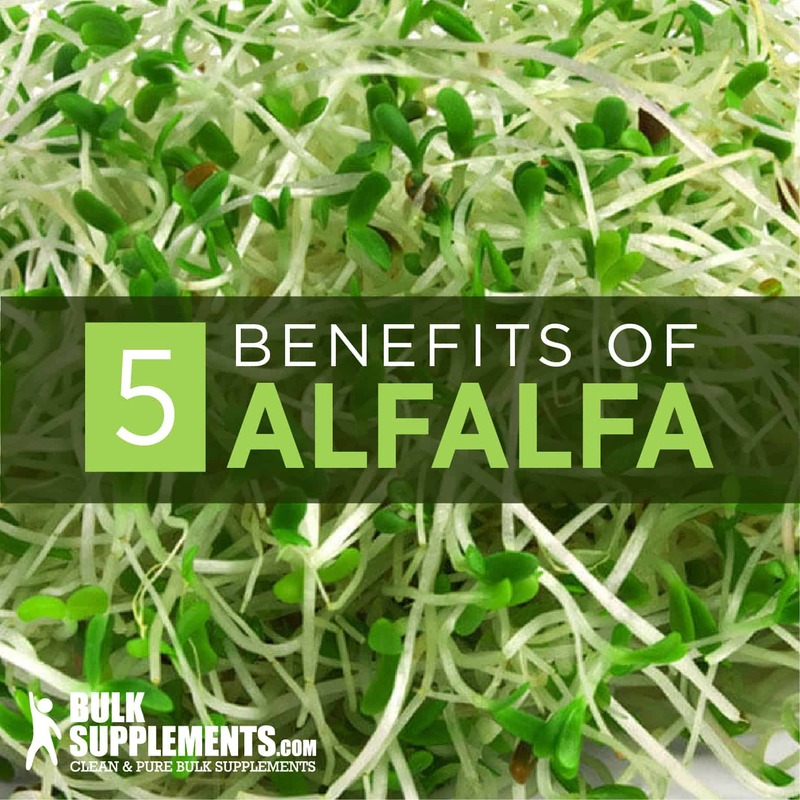 Alfalfa is a nutrient-rich addition to your healthy diet. Alfalfa extract and alfalfa extract powder are sold as tablets or capsules, making it easier than ever to reap the benefits of this plant if you can’t grow it yourself. And those benefits are impressive: alfalfa supplements can help lower cholesterol, prevent hot flashes, and even keep your hair strong and healthy. There’s a reason this tiny herb has been a medicinal powerhouse for thousands of years—it may be a little herb, but it packs a big punch.